How to remove oil. From tree when vine removed. I assume that you mean you will remove a PO vine that has been growing up into a tree, and you want to remove the PO oil residue from the tree stem and/or leaf surfaces in order to avoid exposure to the oil when working with or climbing the tree. I can't think of any way to effectively remove all the oil residue, only specialized soaps/solvents can remove the tenacious oils from human skin even in the best of circumstances. 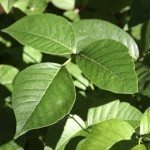 Ordinary soaps and detergents may remove the bulk of the oils, but a person whom is highly sensitive to poison oak may still be exposed and get a reaction. Maybe insecticidal soap sprayed on and then washed off will get some of it, but I don't think it will get all. Time and weathering will dilute and biodegrade the oils and reduce chance of exposure. But give it a year or two if you are highly sensitive to poison oak. If it were me, and I really needed to go into the tree after the PO was removed, I would concentrate on washing my exposed body parts as soon as possible after exposure with Tecnu soap. Follow the directions explicitly, don't shortcut the recommended procedure. It works.